Tiff and I decided to purchase, taste, and review all of those strange fruits in the grocery store that you've seen but haven't been brave enough to try. 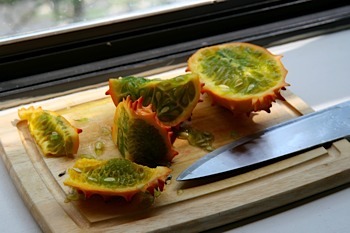 In this first installment, we've tried a "Kiwano" African horned melon. 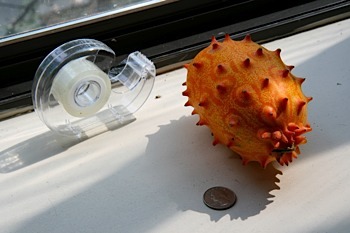 Wikipedia says: The horned melon ... is a vine of African origin, grown for its fruit, which looks like an oval melon with horns, and is very decorative. Native only to the region of the Kalahari desert, it is now grown in California and New Zealand. We generally agree with the Cooking for Engineers review. 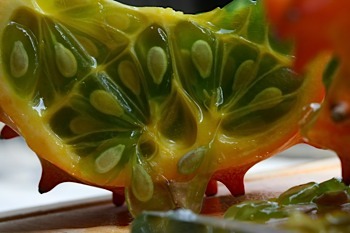 It tastes like a sour cucumber with hints of kiwi and lemon, and the texture resembles an aloe plant's gelatinous, gooey guts, but full of semi-rigid, pumpkin-like seeds. The seeds are hard enough that we don't think we're supposed to eat them, but because they're suspended in the gelatinous goo, it would be very hard to eat around them. Overall, we do not recommend Kiwano African horned melons.